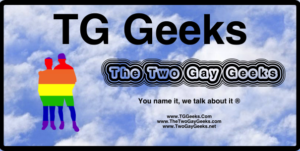 The Two Gay Geeks were among four podcasts selected for finalist judging in the Best Speculative Fiction Fan or News Podcast General category of the Parsec Awards. We are honored to have made it into the finalist judging. The Parsecs are a juried award for podcasts centered around speculative fiction. This covers a rather broad area from works of fiction, through fan commentary/analysis, all the way to the science behind our favorite flights of fancy. Mur Lafferty, Michael R. Mennenga & Tracy Hickman founded The Parsec Awards in 2006 to celebrate Speculative Fiction Podcasting, under the banner of Farpoint Media. Podcast shows are nominated by fans, and finalists are chosen by a yearly steering committee. Those finalists are then voted on by an independent panel of judges from outside of podcasting. 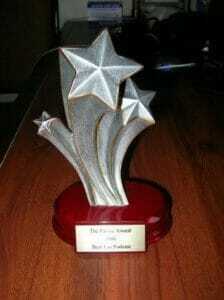 Awards are given in several categories ranging from content to audio quality. 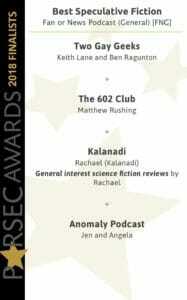 Podcasts ware nominated by listeners and then evaluated by that year’s Parsec Awards Steering Committee and volunteer assistants. The finalists’ audio or video sample showcasing the best of their podcasts were then submitted to a group of independent finalist judges. The finalist judges looked for excellence in audio/video quality, production, presentation, and sheer entertainment value. They weighed the nominees on a scale of 10 to 1 point, 10 being the best. The results were tallied, adding together all of the points, and the podcast with the most in each category was the winner. At this time there is no indication of when the Finalist judging will be completed.